I like to get out and about! Home visits are available across a large area of Mid Devon including Crediton, Tiverton, Silverton, Cheriton Fitzpaine, Witheridge, Cowley, Tedburn, Bow and everywhere in between! Home visits are available Monday to Friday across the Mid Devon area. 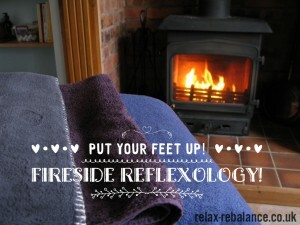 This is a lovely stress free way to access Reflexology treatments in the comfort of your own home. I bring everything we need, including a comfortable reclining Reflexology chair, and you need only provide a cosy blanket and a peaceful space. Do feel free to get in touch with your location and I will let you know. Home visit appointments are for 1 hr 15 min. Click here to head back to the main ‘About Reflexology’ page.